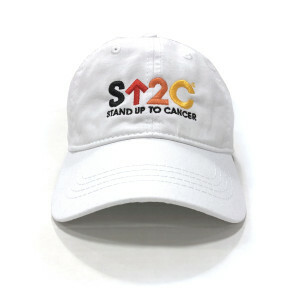 Stand Up with the SU2C Short Logo Baseball Hat in white. Featuring an embroidered logo on the front and an adjustable back for comfort, this style is great to show your support. This hat is terrific. Great fit and of course the message is on point. I ordered this with several other items and found they all came at separate times 10 days apart - with expedited shipping. So if you need in a hurry be careful, otherwise - wonderful purchase for a wonderful cause. I purchased a short logo, Stand Up To Cancer baseball hat for my wife as a celebratory “presento” when she completed her post-surgical, radiation therapy. I am proud of her for having stood up to cancer, and I’m eternally grateful to her care providers for completing the exorcism. Great product, great cause, great campaign!